Today is my ‘birthday’ but not the day on which I was born. It is the day on which, 17 years ago, I ‘acquired’ my Romanian name – Dimitrie. My ‘ziua onomastică’ – onomastic day. Few people call me that: the priests who married us 17 years ago just three days later, my Godfather (ie my ‘best man’ in English terms), my in-laws and a few close friends in Romania who know our story. I’ve had a few messages or calls from some of them today. Other than these a few people know it from questioning my ‘personal’ email address (I have a few addresses, for different purposes). So, today is the day of Sf. (Saint) Dumitru (Romanian) or, with other spellings, Greek, Russian, English, etc – eg Demetrios, Dimitri, Dimitrie. I adopted the latter. He’s rather like St. George but he didn’t slay any dragons as far as I know. Seventeen is a special number for Petronela and me. I have referred to it before I think but it may be the subject of a post in three days time. PS. 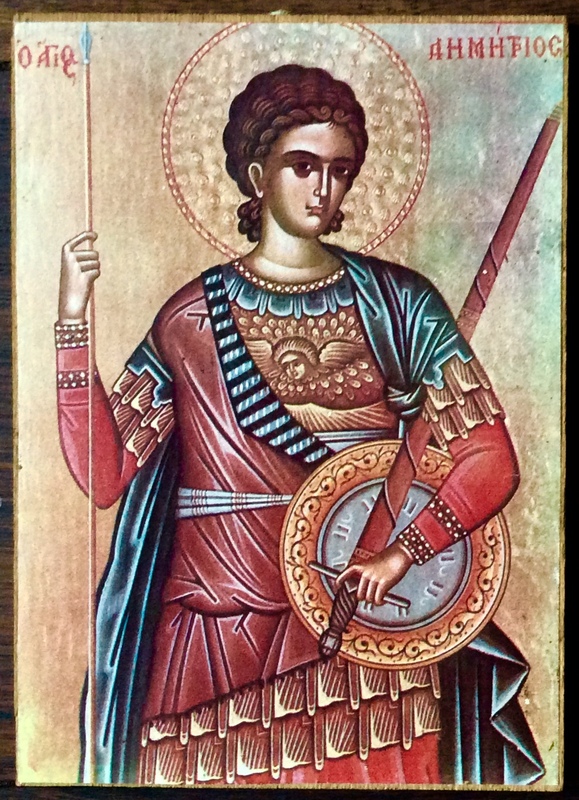 Some churches, eg the Roman Catholic church, celebrate St Dimitrie on a different day. I’ve learnt a new word: onomastic. I must find occasion to use it. If I understand you correct, you have name day today! Congratulations! We have name days – Our calendars have names in every day, except 29th of February :). Thank you Ilze. Yes, you understood correctly. We do not generally have name days in Britain but many people celebrate them in Romania (about 70% Orthdodox Christian, a high proportion practising). Does ‘Ilze’ have a name day and if so, what is it? Dumitru is quite a common name in Romania so we had to send quite a lot of messages. Interesting about the girls’ names. Our Hungarian/Romanian couple neighbours chose British names for their three boys and I can understand that as they have settled here and the boys go or will go to an English school. But why were you averse to Latvian names for your girls? Anyway, I think Linna, Nelle and Helmi are lovely. Sounds like a good reason to me. I suspected as much about Janis as I had heard it before, but I had never heard of the name Ilze though I had an idea it was quite a common name from the number which came up when I was trying to find you on Facebook. I’ll believe you about the pronunciation but anything ‘hard’ doesn’t seem appropriate for you so I’ll keep the way I pronounce it in my head 🙂 . By the way, my first name is my father’s name, as first born son, but I never use it ! That confuses hospitals etc 😉 .